An enlargeable map of Canada, showing its ten provinces and three territories. Canada /ˈkænədə/ is a North American country consisting of ten provinces and three territories. Located in the northern part of the continent, it extends from the Atlantic Ocean in the east to the Pacific Ocean in the west and northward into the Arctic Ocean. It is the world's second largest country by total area, and shares land borders with the United States to the south and northwest, and marine borders with France and Greenland on the east and northeast, respectively. The lands have been inhabited for millennia by various groups of aboriginal peoples. Beginning in the late 15th century, British and French expeditions explored and later settled the Atlantic coast. France ceded nearly all of its colonies in North America in 1763 after the Seven Years' War. 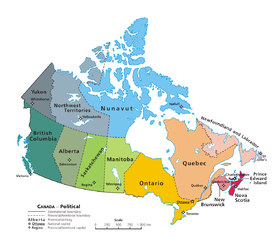 In 1867, with the union of three British North American colonies through Confederation, Canada was formed as a federal dominion of four provinces. This began an accretion of additional provinces and territories and a process of increasing autonomy from the United Kingdom, highlighted by the Statute of Westminster in 1931 and culminating in the Canada Act in 1982 which severed the vestiges of legal dependence on the British parliament. Canada is a federation that is governed as a parliamentary democracy and a constitutional monarchy with Queen Elizabeth II as its head of state. It is a bilingual and multicultural country, with both English and French as official languages at the federal level. Technologically advanced and industrialized, Canada maintains a diversified economy that is heavily reliant upon its abundant natural resources and upon trade—particularly with the United States, with which Canada has a long and complex relationship. A satellite image of the Great Lakes. Nova Scotia, New Brunswick, British Columbia, and Prince Edward Island were separate colonies at the time of joining Canada. Manitoba was established simultaneously with Northwest Territories. Saskatchewan and Alberta were created out of land that had been part of Northwest Territories. Prior to its entry, Newfoundland was a Dominion within the British Commonwealth. There are currently three territories in Canada. Unlike the provinces, the territories of Canada have no inherent jurisdiction and only have those powers delegated to them by the federal government. Note: Canada did not acquire any new land to create Yukon, Alberta, Saskatchewan, or Nunavut. All of these originally formed part of Northwest Territories. Royal Canadian Air Force (RCAF), command of the Air Force. Canadian Special Operations Forces Command (CANSOFCOM), responsible for special forces operations within Canada and abroad. ^ a b "Canada". The World Factbook. United States Central Intelligence Agency. July 8, 2009. Retrieved July 23, 2009. ^ "Canada: History". Country Profiles. Commonwealth Secretariat. Archived from the original on 2007-10-12. Retrieved 2007-10-09. The British North America Act of 1867 brought together four British colonies ... in one federal Dominion under the name of Canada. ^ The total length of the land border between Canada and the United States is the longest between any two countries. ^ The coastline of Canada is the longest in the world. The total length of the coast of Canada is more than five times as long as the circumference of the Earth. ^ "Census Profile: Canada". 2011 Census. Statistics Canada. Retrieved 1 June 2012. "Canada". The World Factbook. Central Intelligence Agency.